It’s not surprising to see many trend trading systems fail; main cause for such failure is an improper understanding of trending market and market structure that follows it. Markets rarely trend at one simple, consistent rate. It is very common to see a trend line broken and later the original trend will hold, in a shallower slope. Trading on breaks of trend lines are frustrating because these breaks are often random noises which simply move into another degree, level, or rate of trend. That’s the reason we need to consider that break of the trend lines are not indication of trend termination. What is Rate of the Trend? To get an idea of the concept see the chart below. 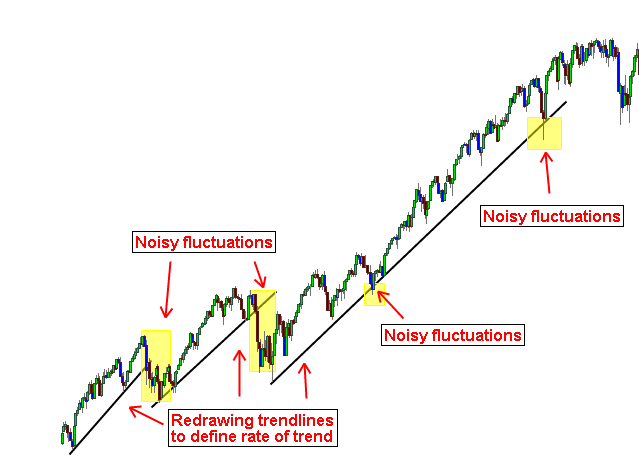 Price chart shows noisy fluctuations at the trend lines and trend lines redrawn to define the new rate of trend. 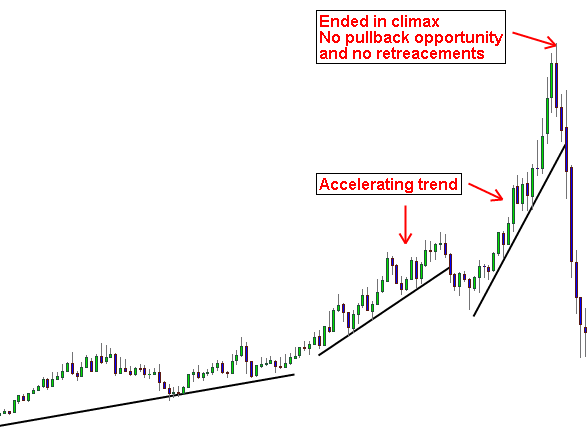 This type of price action often happens in extended trends. It is also possible in markets to observe a new, steeper trend. A common spot where this can occur is on a break beyond a parallel trend line, but this can also happen at any point in a trend if a catalyst causes the supply/demand imbalance or buying or selling pressure. In the picture Price action slowly accelerates in a trend that eventually ends in a parabolic climax, and ever-steeper trend lines are drawn to contain the new trend. These greatly accelerated trends will eventually reach rates that are unsustainable, as they often end in minor climax moves. At this point, trend lines will be more or less vertical. It is important to avoid attaching too much significance to a break of these vertical trend lines, they are still useful for measuring the rate of the trend, but they are always broken easily. These vertical trend lines are marking parabolic markets, Dramatic trend reversals are possible, so it’s important to be cautious. Trend lines may not be the best tools to trade in these areas (as pointed out by decision point traders), but they can show important structures and areas to watch. Will ITC Share prices Breakout from this Multiyear Range?